Apologies for sending out a Christmas message this early, but there’s a very good reason for it. This year, we’re going to say thank you to our customers by filling boxes with food and gifts to support disadvantaged families. 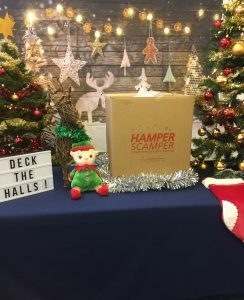 We’re starting by supporting the Hamper Scamper initiative and their deadline is the end of November, hence this early message! Over the next ten days, we’ll be popping food items and gifts in the hamper to recognise the achievements of our customers and of our team. Look out for this on social media, especially Twitter, where we’ll be Tweeting from our @ISOQSL account using the hashtag #ISOQSLelf. Unfortunately, we can’t mention every customer by name, but you are invited to share relevant tweets to highlight awareness of your certifications.